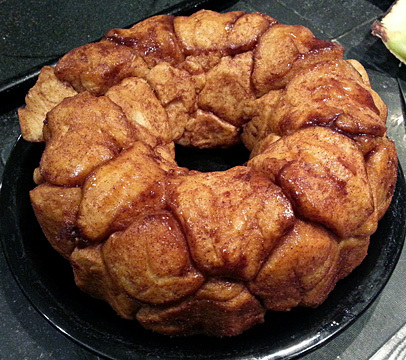 One-Hour Yeast Risen Monkey Bread | Have YOU Ben Starr Struck? Monkey bread probably evolved out of a 1950’s housewife’s attempt to turn canned biscuit dough into a more glamorous breakfast food. Traditionally it’s made from taking canned biscuit dough, rolling it in butter and cinnamon and sugar, and baking the dough balls in a bundt pan. The theory was that the little dough balls would get coated with caramely-spiced sticky goodness and end up sort of like a cinnamon roll, but with less time and effort. As new products arrived on the market, frozen dinner-roll dough balls sometimes got substituted for superior flavor, because short-bread biscuit dough easily dries out when it overbakes and doesn’t have that yeasty flavor of roll dough. 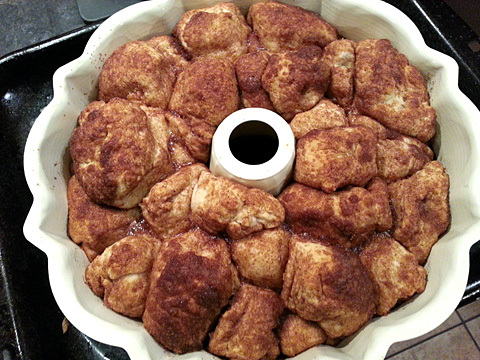 Monkey bread is a great thing to serve to a crowd for breakfast. It’s called monkey bread because you have to peel a dough ball off the finished cake, and your fingers get all sticky when you eat with your hands, like a monkey’s. While I prefer to make REAL yeast cinnamon rolls for a special-occasion breakfast, that involves me making up the dough the night before, and the rolling and cutting process to make the individual cinnamon rolls is tiresome and messy. Then they chill overnight in the fridge and have to rise the next morning before baking. NIGHTMARE! Recently I developed a recipe for monkey bread that takes about 1 hour from start-to-finish, and it contains all that soft, moist, yeasty yumminess you get from cinnamon rolls. Plus, you don’t have to deal with storebought frozen dinner-roll dough, which has to sit around and thaw before it can be baked. And you get the joy of saying you made these 100% from scratch. The only special equipment you need is a stand mixer (or powerful food processor with a dough hook) and a small levered ice cream scoop…you know, the kind with the handle you squeeze and it moves a lever across the scoop to remove the ice cream. We’re using these because we’re making a much softer yeast dough, almost a batter, and it would be a nightmare to handle with your fingers. You have to use the small-sized scoop that’s like 2 Tablespoons’ worth. This scoop is indispensable in my kitchen, I use it most often to make evenly-sized cookies. Spend the $15 and get yourself a sturdy one that you can put in the dishwasher and that will hold up for years of use. Stir until most of the yeast is dissolved, and set aside in a warm place. In 15 second increments until it is warm. Stir between heating increments. The buttermilk may start to look separated, stirring will bring it back together. Don’t overheat or it will curdle, you just want it warm, around 100F. It should come together as a VERY soft dough, just a little stiffer than a batter. The bottom of the dough should still stick to the bowl as the hook kneads it, but the sides should have pulled away from the bowl and follow the hook around. You will probably need to add 1/2 – 1 cup of additional flour to get it stiff enough, but don’t add so much that the dough pulls away entirely from the bowl at the bottom. It is better to add too little flour than too much. Spray a bundt pan liberally with cooking spray. Using a small ice cream scoop, the kind that has the lever that moves back and forth and detaches the ice cream from the scoop, scoop up the dough and drop into the melted butter. 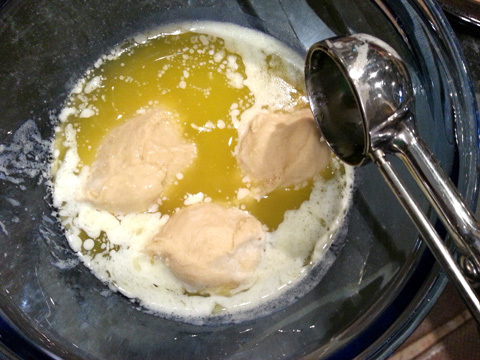 Using 2 forks, toss the dough ball around in the butter, then lift it out and drop it into the spices. With your fingers, roll the dough around in the spices and drop it into the bundt pan. Continue until all the dough is gone. 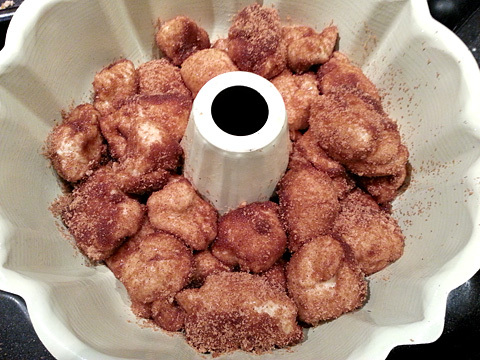 Combine any remaining spiced sugar and butter together and pour over the dough balls into the bundt pan. Place the bundt pan into a COLD oven, and immediately turn the oven on to 350F. The monkey bread will rise as the oven preheats. Remove from the oven and let it sit on the countertop for 5 minutes. Then invert onto a serving plate. Serve immediately! This entry was posted in Breakfast, Recipes, Vegetarian, Yeast Breads and tagged bread, quick rise, yeast. Bookmark the permalink. Non-iodized salt…..iodine makes a difference in cooking???? Should I not use it or is it preferred non-iodized??? Iodine kills yeast so yes, it would make a difference. Dee, you don’t need to use iodized salt. That’s a holdover from the depression era when people’s diets weren’t varied enough to provide iodine, a necessary micronutrient. I’m not sure why salt manufacturers continue to make iodized salt, but they do. Iodized salt imparts a horrible flavor and smell when you use it in proper quantity for most recipes. If you have iodized salt in your cabinet, bring a pot of water to a boil like you’re going to cook pasta, then throw in 1/4 cup of iodized salt (about how much you should use in a gallon of pasta water). Immediately you’ll notice the chemical smell. Throw away your iodized salt, and buy sea salt or kosher salt from now on! And Sam is right…iodine is a chemical that kills bacteria. Yeast are bacteria. So you place extra strain on your yeast when you use iodized salt. What kind of yeast do you use? fast rising? Cheryl, there’s very little difference between rapid rise yeast and conventional yeast. Rapid rise granules are smaller, so they dissolve more quickly, and there is MORE yeast in each teaspoon. It was developed for bread machine use, and I never use it. Within a few minutes of hydration, as long as there is flour or sugar to eat, both yeasts have developed the same growth rate, so it’s not really a big deal either way.